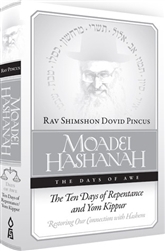 Moadei Hashanah, The Ten Days of Repentance and Yom Kippuris the ninth sefer from Rav Shimshon Dovid Pincus zt"l to appear in English. It is part of the enormously popular Hebrew Sichos series, read by thousands of people across the world. Rav Pincus, venerated Rosh Yeshivah, beloved Rav of Ofakim, and worldwide lecturer, spoke passionately concerning the Aseres Yemei Teshuvah and Yom Kippur and the proper way to approach them. These lectures are transcribed in this powerful work. Rav Pincus clarifies the ways of teshuvah and opens their gates to all. He explains profoundly how the Thirteen Attributes of Divine Mercy work, helping us effect real change and renew our close attachment to Hashem. And he offers practical advice on how to make Yom Kippur into what we know it should be. These insights can surely transform lives. 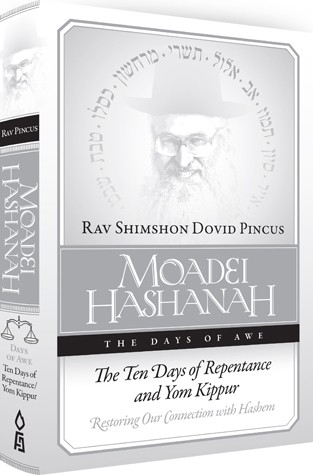 This latest volume of the Moadei Hashanah series enriches and adds new dimensions to these crucial days that hold the key to the entire year. Rav Pincus' depth, relevance, and wit as expressed in this book are sure to inspire each person and raise him to a new level of teshuvah and kirvas Hashem.